On the 28th March 2012 at the Current Researches in Egyptology conference in Birmingham I will present [I should now say presented] textual evidence from Old Kingdom Egypt that conclusively confirms that the Ancient Egyptians used encircling symbolism to protect and ritually sanctify their pyramids. I have been studying this issue since at least 2004, and in 2008 I published a book entitled “Egyptian Tomb Architecture: The Archaeological Facts of Pharaonic Circular Symbolism” (Lightbody 2008), but it is only in the last year that I have finally been able to identify an Old Kingdom text that explicitly confirms what the archaeology and artwork was telling us. This text also confirms why they did this. I was only able to achieve this with the help of many archaeologists and Egyptologists, amateur and professional, living and dead, who have dedicated their lives and taken great care to collect, compile and publish detailed information about the Ancient Egyptian world. Some of those were Egyptologists I met at the previous CREXII conference in Durham. Back in 2004, after I had reviewed the technical and survey data from the Giza Pyramids (in conjunction with colleagues, one of which eventually constructed a detailed three-dimensional digital model of the pyramid of Giza as it was when built), I wrote an article to Nature journal detailing the view that the proportions used in the architecture at Giza did confirm Egyptologist Flinders Petrie’s conclusions that circular symbolism was incorporated into the architecture of some of the greatest of the pyramids (notably Khufu’s at Giza and at Huni/Sneferu’s at Meidum). The reviewer agreed that the data stacked up, but could not accept the article because I had not attempted to provide any explanation for why this had been done. Flinders Petrie also never ventured an explanation. Some other Egyptologists thought that it might be related to the circle that symbolized the sun god Re, but their interpretations were inconclusive. The Nature reviewer was of course quite right to demand some sort of clearer explanation for this phenomenon, based on hard evidence, and so for the next four years I researched the iconography, beliefs and rituals of the Old Kingdom Egyptians to see if I could better understand what had been going on. I went through every type of circle used in Egyptian artwork methodically, and studied their meanings. There are many, many, circles used in Egyptian art, but when I got to one particular circular symbol, the shen ring, all of the different pieces started to fall into place. The main problem had been that many modern, mainstream, Egyptology publications had oversimplified definitions of what the shen ring meant to the Ancient Egyptians. These definitions were often simplified to the word ‘eternity’, whereas a better definition for what this symbol means is in fact ‘eternal royal encircling protection’. When carried by the falcon god Horus above the king this ring symbolized that the king was forever encircled by the protection and blessings of the god. Horus was the patron god of the king, and the king’s name was even written in an extended version of this shen ring, now called the ‘cartouche’, but known as the shenu in Ancient Egypt. It was only by studying the more in-depth dictionaries of Egyptian hieroglyphs that I was able to identify that this more complex meaning had existed at all, within the texts and minds of ancient Egypt. The king was not only protected in life, but took similar measures to ensure that he would be protected in the afterlife, and that his whole kingdom was encircled and protected by Horus. The new evidence shows that the king’s tomb was protected with this same encircling protection of the god Horus that was frequently depicted by way of Horus holding the shen ring above the king. Most importantly, this encircling symbolism was expressed in the basic proportions of the architecture used in the pyramids (in the overall outer dimensions and within the main tomb chambers). This accords with the conclusions reached by the great English Egyptologist, Flinders Petrie. After surveying the pyramids in meticulous detail Professor Flinders Petrie concluded that “…these relations of areas and of circular ratio are so systematic that we should grant that they were in the builder’s design” (Petrie 1940). Horus was the premier god of kingship, and had been since the Predynastic Period, and it is Horus, not Re, that was associated with this architectural symbolism (although Horus and Re were in fact closely related, to the extent that the gods were even syncretised in a hybrid version, Re-Horakhty). Many dynasties after the Old Kingdom, the Egyptians continued to use this encircling protection of Horus to protect their kings in the afterlife. This was also included in the architectural designs of the New Kingdom royal tombs, the ‘pyramid tombs’ of the Valley of the Kings. Some of these tomb chambers were deliberately built to reflect the shape of the extended shen ring, the royal cartouche, and the sarcophagi themselves in which the pharaohs were entombed were also often formed as cartouches. I spoke about this last year at the Current Researches conference at the University of Durham and presented several examples of supporting evidence, and the paper is now published in the proceedings of last year’s conference (Lightbody 2012). A further development was in the depiction of the actual wings of Horus on the decorated rishi (feather) coffins of the late Middle and New Kingdom, with details in the form of wings and shen rings held in falcon claws in front of the king’s body (e.g. 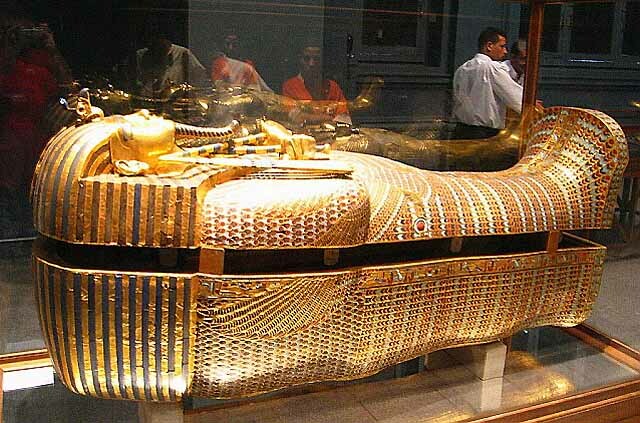 see the shen on the side of the photo linked above from Tutankhamun’s burial). Additional avian winged pectoral necklaces were draped around the pharaohs neck, sometimes representing Horus, and sometimes the vulture goddess Nekhbet who was also associated with the shen ring. Temples were protected by representations of both of these flying guardians on the encircling enclosure walls, and on the architraves aboved the entrances, where the visitor first crosses the encircling boundary between the profane world outside, and the sacred area within. The eye of Horus also reflected this as a protective motif, and was depicted on sarcophagi, coffins and amulets. I have been studying this architectural and iconographic symbolism for more than ten years now, but it is only now that I have been able to identify a textual source from the Old Kingdom that conclusively states that this symbolism was used in the context of the pyramids, and additionally, explains what it meant to the Egyptians. I believe that the information I will present at the Current Researches in Egyptology conference in March will constitute a conclusive and coherent body of evidence that shows, beyond all reasonable doubt, that this is exactly what the Ancient Egyptian pharoahs and architects were thinking when they chose their designs, commissioned their artwork and engaged in their rituals. 2012 The Encircling Protection of Horus. Proceedings of the XIIth Annual Current Researches in Egyptology Conference at the University of Durham, 2011. BAR, Oxford. See the main page for the new information added post conference.